The Saloon is physically and socially the heart of the house. 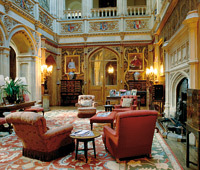 It was designed for the 4th Earl by Thomas Allom in a gothic style with rich decoration and completed in the 1860's. The remarkable wall coverings are made of leather. They were brought back from Cordoba, Spain by the 3rd Earl and date from 1631. They were hung here in 1862. The room is dominated by Van Dyck's great equestrian portrait of Charles I. Either side are portraits of Carnarvon ancestors who took part in the civil war in England in the 1640’s. The double library was in its heyday during the late Victorian period. At this time, it was used by the 4th Earl of Carnarvon as a "withdrawing" room. The Earl was an active Tory in Parliament, a member of Disraeli's Cabinet in the 1860's and 1870's. Here he could discuss politics with friends or retire in peace. There are over 5,650 books, the earliest dating from the 16th century. The Library is as much used by the family today as in the past, and is a focal meeting point for drinks and conversation both before and after lunch and dinner. The Music room is a wonderfully sunny south-facing room with views towards two follies: Jackdaw's Castle to the east and Heaven's Gate at the summit of Siddown Hill. The baroque ceiling was painted by Francis Hayman in the 1730’s whilst the walls are hung with Italian 16th century Italian embroideries. In 1895, Alfred de Rothschild gave his daughter Almina bolts of green French silk from which to decorate this lovely south facing Drawing Room. Narrow cupboards between the double doors from the Drawing Room to the Smoking Room hid the 5th Earl of Carnarvon's collection of Egyptian antiquities. Dutch paintings from the 17th Century represent some of the earliest works of art brought to Highclere by the Carnarvon family. Early 19th Century art from a Grand Tour, hang high on the walls, whilst others link to family cousins at Wilton House, together with some of the portraits in the Dining Room.